Now here's something you probably won't find on any other website or in any store. These are ultra-rare P45T to P43T H4 headlamp bulb adaptors. These allow you to use standard modern-day P43T based H4 Halogen bulbs with classic 50s, 60s and early 70s headlamps which were made to use the now obsolete and hard to find P45T based Tungsten Carbide & H4 halogen bulbs. This would include the famous Lucas PL-700 tribar headlamps and several other vintage Cibie, Hella, Carello and Bosch headlights from that era. These headlamps were used on classic Jaguars, MGs, Triumphs, Jensens, Austins, Austin-Healeys, Mercedes, Rolls Royces, Bentleys, Aston Martins, Porsches, Volkswagens, BMWs, Shelbys, Volvos and several other fine cars made around that time. The adjacent photo (above left) shows one of these adaptors fit onto a vintage Lucas PL700 headlamp. If you look at that photo you'll be able to see the difference between a P45T and a P43T based bulb. The P45T bulb is the one on the right. Aside from the obvious differences in bulb style, there are several significant differences in the bases. The P45T bases are round with no tabs and 45 mm in diameter. The P43T bases are also round but have three protruding tabs and are only 43 mm in diameter. Consequently, P45T and P43T bulbs cannot be interchanged. Not without the proper adaptors that is. Modern day H4 bulb fit on classic '60s concave lensed Euro Cibie headlamp using P45T to P43T adaptor ring. Q. Why would you want to use a P43T based bulb on a vintage P45T headlamp that was meant to take a P45T based bulb ? A. Well, there are several good reasons. 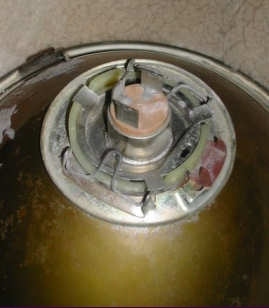 P43T based bulbs are still being used today and are easy to get at gas stations, department stores and autoparts stores. There are many makes and varieties (i.e. 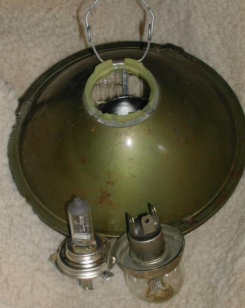 standard H4 Halogen, Xenon, SilverStars, etc.) There are also several wattage combinations to choose from as well. In contrast, P45T based bulbs have long been obsolete and are tricky to find. There weren't that many headlamp models that were made to use them and those lamps weren't being made for very long. As a result there aren't that many people that still have and use them so consequently, the market for P45T bulbs is very small. As a result, finding replacements for them can be pretty darn tough. When you do find them, they're usually quite expensive and there aren't that many brands, wattages, or types of bulbs (i.e. Xenon, etc) to choose from. Futher, most of the P45T bulbs you can still buy are quite dim by todays standards so safety can become an issue as well. There are some H4 Halogen P45T bulbs available from one or two (somewhat hard to find) specialty vendors but those bulbs are quite expensive and they only come in the standard wattage. With these adaptors, however, you can use modern P43T based bulbs which can be found just about anywhere headlamp bulbs are sold and you'll suddenly have a wide variety of brands, wattages and types to choose from. In short, they're an absolute must for the classic car buff who's serious about keeping their vintage automobile(s) period-correct but who doesn't want to sacrifice safety and convenience to do that if they don't have to. These adaptors give you the best of both worlds ! These adaptors are not available from ANY store or parts supplier anywhere in North America and are virtually impossible to find anywhere else in the world for that matter. Heck, we defy you to try and find an auto parts store or specialty shop that even knows these adaptors exist let alone sells them ! We literally have to go to the ends of the earth to find these suckers and we're 100% sure you won't find any vendor in North America that sells them and we've heard from many European car enthusiasts that they're near impossible to to find in any store in Europe either. We don't think that many of these adaptors were ever made and we're pretty sure they aren't being made now so that's probably why they're so hard to find. That being said, it seems as though it's getting harder to find these things astime goes by. Our guess is the supply is pretty much dried up out there. When we do get lucky and find some we buy as many as we can but we usually can't get very many and we never know if we'll ever be able to get more. Right now we do have a few pair for sale but you might be well advised to jump on the opportunity to get some now while you can because we can't guarantee we'll have more to sell once these last few pairs are sold. Well, here's the kicker. You might expect that these things are going to be expensive with them being so rare and you'd pretty much be correct. We try to keep the prices as reasonable as we can but we do have to pay a fair bit for them whenever we manage to find them so they do end up being a tad bit expensive - but not stupid crazy expensive. On the bright side, you'll save some money buying P34T bulbs in stead of those expensive P45Ts so the adaptors will eventually pay for themselves. Notwithstanding that, it's the increased safety you get from being able to use brighter bulbs that really makes them worth every penny you have to pay for them and then some. These things are very light and can be fit into a standard letter envelope so we'll cover the cost of mailing them. * Notes: Free shipping is limited to standard air mail service. You'll have to pay the actual cost of shipping them if you're in a big hurry for them and want them couriered to you or shipped by eXpedited or eXpress Air Mail service. 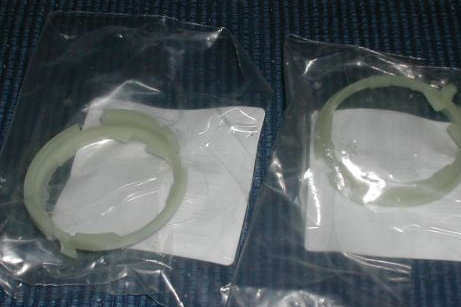 Here's what a pair of the adaptors look like in their wrappers.